Sarah Lucas’s Geezer reminds us that we should think twice before throwing away the pizza coupons someone slid under our door. Lucas has a special knack for using food in her art, and in this case she makes clever use of her pizza coupon stash by collage-ing it into a portrait. 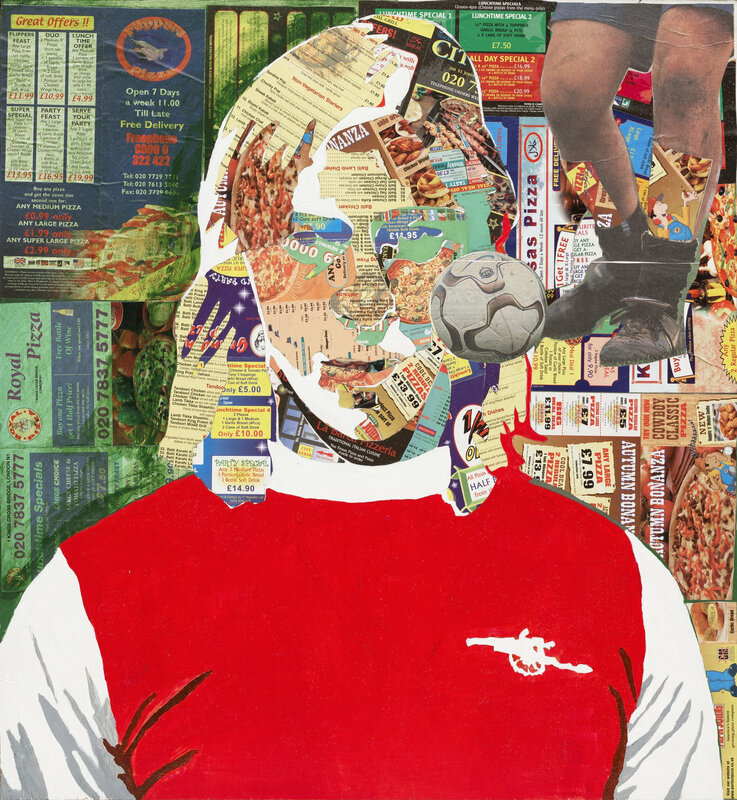 It is simultaneously a self-portrait and a portrait of the 1970s Arsenal soccer star, Charlie George. Charlie George is bestowed with the honor of being Sarah Lucas’s male doppelganger, partially because of his physical resemblance to Lucas (same lean build and hair parted down the middle and partially because of their biographical similarities (both grew up in working-class, north London). Charlie was Lucas’s brother’s friend, and to child-aged-Lucas, he was more than just her older brother’s hot friend. He also showed her the possibility of escape from the working-class suburb. The portrait is one of many classic Sarah Lucas gender-benders in which she explores androgyny. Lucas’s Geezer delves into gender ambiguity and mocks the macho-ness of sports, but she would likely want to remind us that it’s also there purely for the sake of controversy. After all it was her passion for provocation that helped her build a reputation as the most wild and outspoken of the Young British Artists - quite the accomplishment when you consider the fact that Damien Hirst and Tracey Emin were among the competition. In one interview Lucas said she liked to make sweeping declarations about things she didn’t believe, just to stir up trouble. Her example being the time she said, “I'm a better bloke than most blokes,” in reference to her self-portraits. And blokier she is! I’m sure I’m not the first to admit it, but Lucas makes a much better bloke than I do. Interestingly enough, Lucas’s effort to comment on her own sexual ambiguity inspired David Bowie to do the same. He began to portray himself as a Sarah Lucas doppelganger in movies and magazines. Countless bands and models then followed in Bowie’s footsteps, not realizing that they were actually following the boundlessly-hip Sarah Lucas. "Sarah Lucas gives an exclusive interview to Gordon Burn." The Guardian. October 17, 2005. Accessed August 23, 2017. https://www.theguardian.com/artanddesign/2005/oct/17/art. Sussexarts. "Tracey Emin, Sarah Lucas & Rachael Whiteread: Did feminism feature as a part of Young British Art?" Chalk. October 10, 2012. Accessed August 23, 2017. https://chalkjournal.wordpress.com/2012/04/19/emin-lucas-whiteread/.